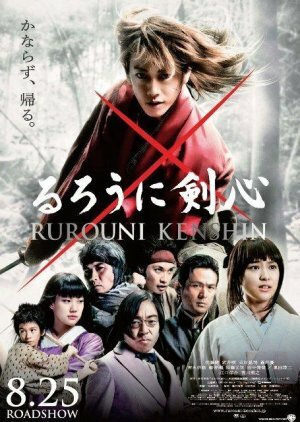 I've been a fan of the Rurouni Kenshin anime for at least 7 years now. It was one of my first anime, and it's been one of my favorites ever since. So when I first heard about the live action adaptation I was a little apprehensive. I was afraid that they were going to ruin the memory of yet another one of my favorite anime. However, this movie went beyond my expectations and was actually pretty good. It kept a lot of the Kenshin anime 'feel', the seriousness along with the moments of comedy that I so dearly love. Story 8/10: The story was interesting, though predictable (mainly due to the fact that I have watched the anime.) Cast 10/10: The cast did a wonderful job bringing the characters to life. 9/10: The music was very good and fit the scenes perfectly. Even though its been 3 days since I watched hte movie, i'm currently listening to one of the songs (by One Ok Rock) from the movie. Rewatch Value 6/10: This film is a decent rewatch. Cinematography 10/10: Even though we don't have a section for Cinematography on here, i felt this movie deserved one. Normally I don't notice Cinematography since it's not too big of a deal. But this movie went above and beyond normal cinematography. Overall 9/10; What are you waiting for? Go and watch it if you haven't already!